Here at Artful Home, most of the pieces we sell are shipped directly from artists’ studios. 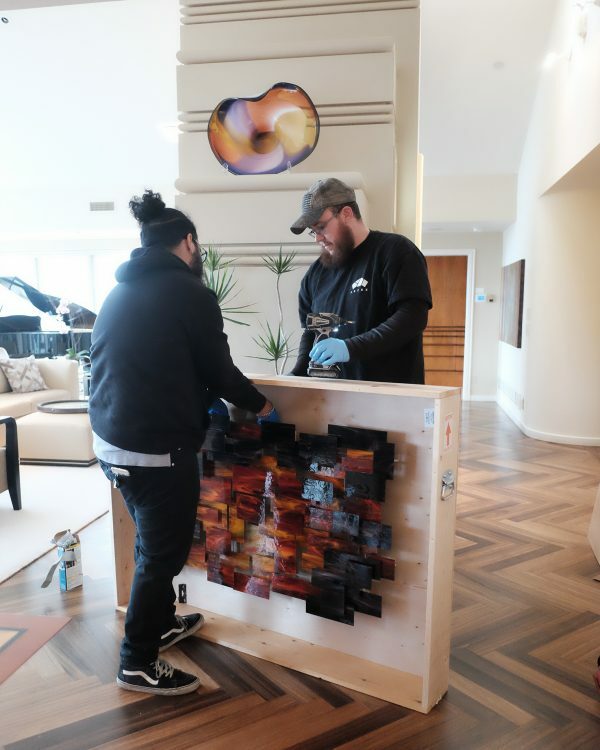 Though we work closely with artists, customers, and shipping companies to ensure that the process goes smoothly from start to finish, we rarely get the chance to be there in person for the delivery—or to see how great the art looks in its new home. So imagine our excitement when a local customer, Linda, invited us to her home to witness the installation of a custom sculpture. 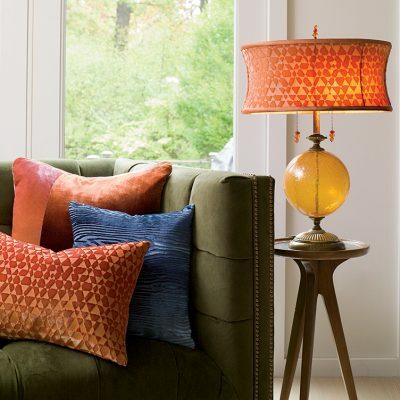 Linda, a native of Madison, Wisconsin, has been a longtime friend and supporter of Artful Home. 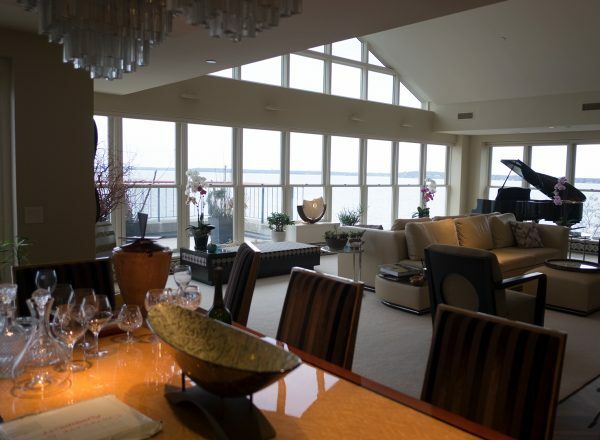 She was a gracious host as we toured her beautiful lakeside home and marveled at the many works of art she has on display. 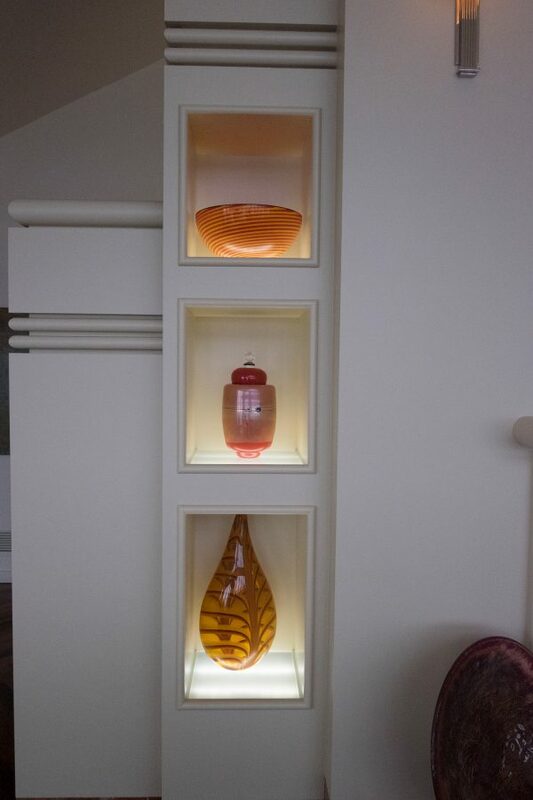 Part of Linda’s collection of glass artwork, including a piece by Richard S. Jones (center). 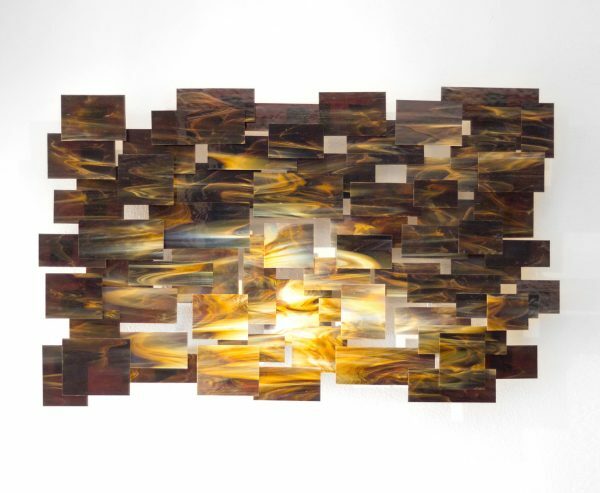 A dramatic wall sculpture, “Wenge Wallwave” by Kerry Vesper, is complemented by a variety of other works of art. 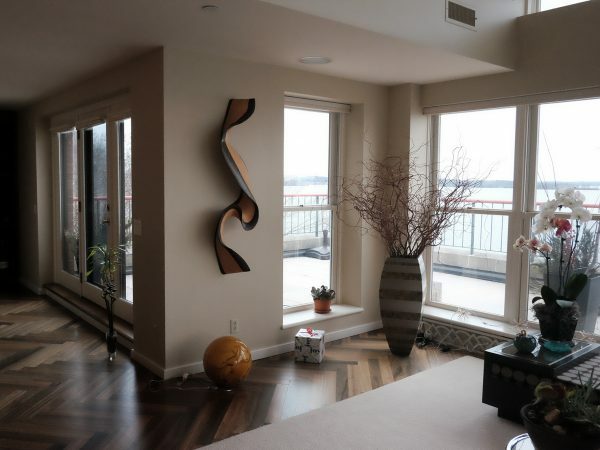 Linda’s most recent purchase, a glass wall sculpture by Karo Martirosyan, was specially designed to look great in her home and to mirror the stunning lakefront view from her living room window. Having discovered Karo Martirosyan in one of our seasonal catalogs, Linda reached out to us to find out more about ordering one of his signature sculptures, “Cosmos.” The artist sent her samples of the glass so that she could see how the colors looked in her house. When she first saw the glass in person, she wondered about adjusting the colors to coordinate with her woodwork and the neighboring waterscape. The original version of Martirosyan’s “Cosmos” includes shades of amber, cream, and brown. 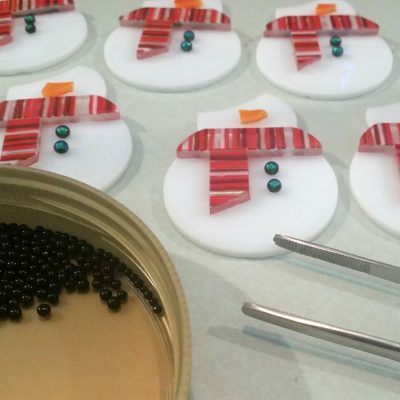 For two months, a member of our Customer Care team corresponded with Linda and the artist, discussing glass colors as well as the weight and dimensions of the final piece. 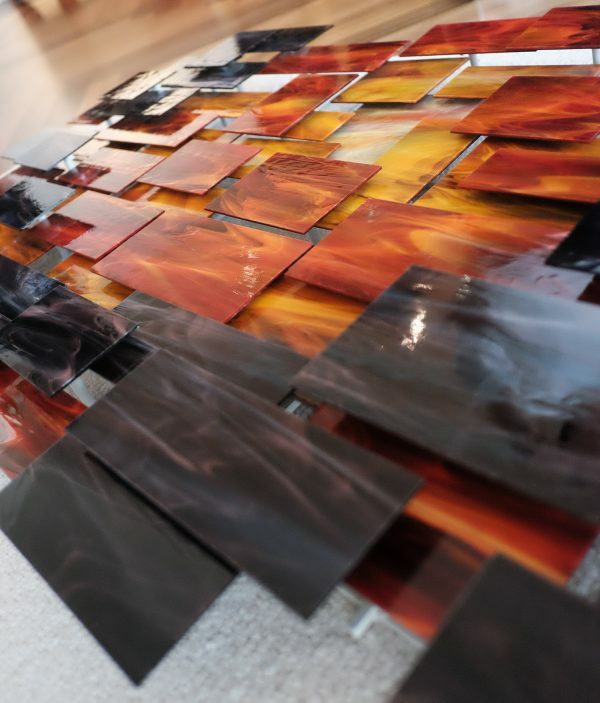 The artist sent custom-colored glass samples to Linda, plus digital images of different designs superimposed on her wall to help her visualize the final results. Eventually, they agreed on a palette that evoked the beauty of a vibrant sunset on rippling waters, with swirling amber hues in the center giving way to an expanse of rich reds and oranges edged in deep shades of browns. 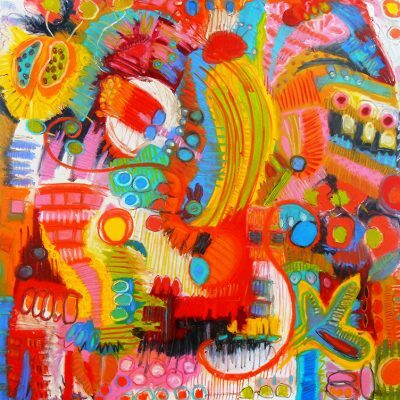 Linda’s customized version of Karo Martirosyan’s “Cosmos” is full of warm, vibrant colors. 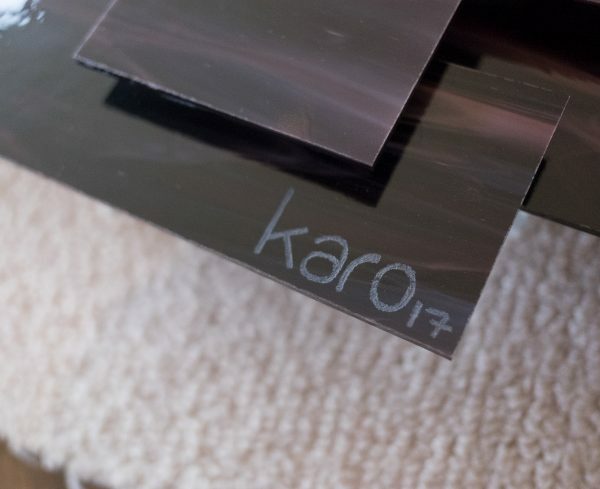 The artist’s signature is etched into the glass. A glass piece of this size can’t simply be mailed in a box with some bubble wrap. It must be secured in a sturdy wood crate to avoid breakage, and it needs to be delivered by a freight company that can handle such delicate pieces with great care. 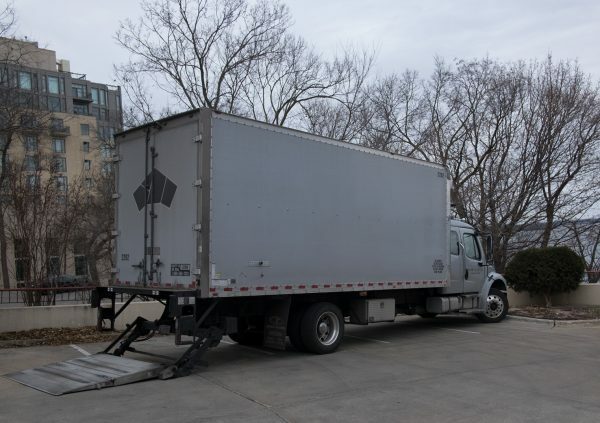 For such shipments, we partner with Artex, a fine art freight service, and they arranged the final shipping and installation of Linda’s new piece. Linda’s new sculpture awaits on this truck! Martirosyan ships his sculptures in sturdy wood crates. Once the installation specialists from Artex arrived at Linda’s home with the piece, the installation process took several hours, including the initial measurements and removal of the crate. 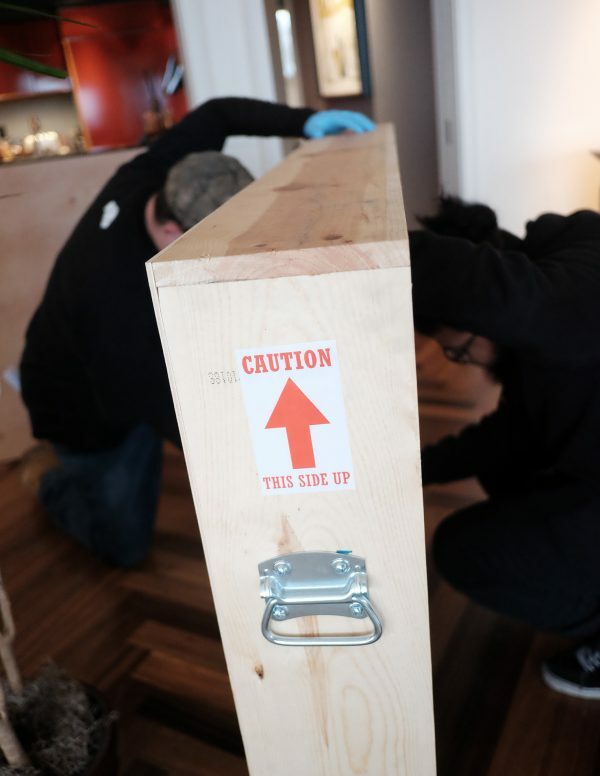 The installation specialists carefully unpack the artwork from its crate. Above them is a sculptural vessel by Janet and Rick Nicholson. Taking measurements to prepare for hanging. Everything was going smoothly—until the installation specialists made a surprising discovery. As they searched the wall for the wooden studs on which to secure the piece, they found something strange: there were no studs! It turns out that Linda’s home was built with an industrial framework, and behind the intended wall, there was a steel plate instead of wood studs. Linda had no idea this was the case, having never encountered such issues elsewhere in her house. 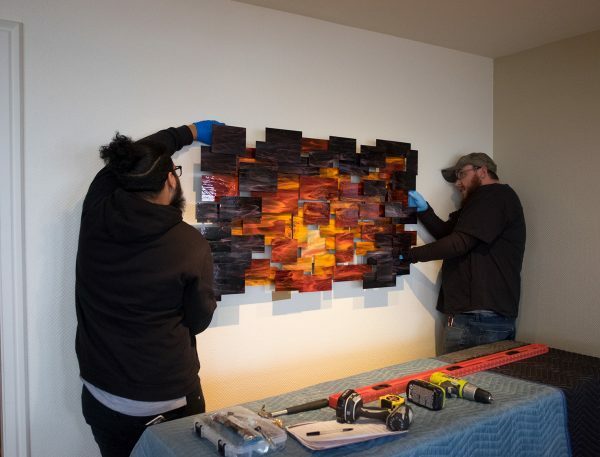 The installation specialists had to completely reassess how they were going to hang the piece. After considering the kind of support needed for the work’s weight and size, they decided to use several portrait hooks instead of the intended butterfly anchors. They shifted the hooks around to ensure that the weight of the piece was evenly distributed, without leaving the hooks visible through gaps in the glass. The installation specialists hang the piece on a series of portrait hooks. Success! Despite the hanging hiccup, the uncrating and installation process went very smoothly and professionally, thanks to great communication between the artist, customer, and shipping company. We were thrilled that we had the opportunity to take part in the experience—and most importantly, that Linda was ecstatic with her new work of art. 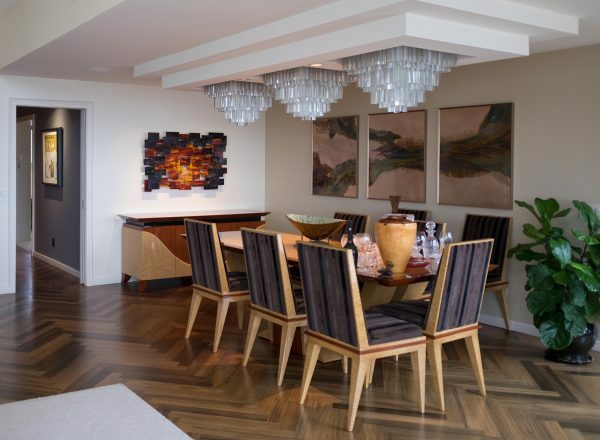 I enjoyed the process of looking at samples, communicating with the artist, and then seeing the fabulous final creation…Thank you, Artful Home, for inspiring me to put a statement piece in my glass collection. You made the process simple yet personally fulfilling. Viewed from the side, the intricate structure that gives the piece depth and dimension adds further visual interest. The newest addition to Linda’s home looks absolutely stunning. All photos were taken by Holly Williams. Many thanks to Courtney Scanlan for coordinating the trip and detailing the installation process. showing pictures of art installed in a beautiful setting. 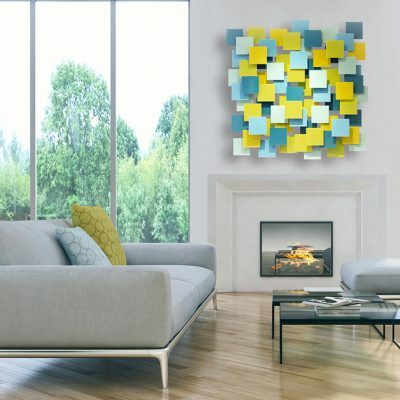 Most people can’t really visualize how specificart will look on their wall. Showing is a Great Idea. Artful Home might also like to contact John Zidek at http://www.johnzidek.com/ I think he would be a good candidate for display on your site. 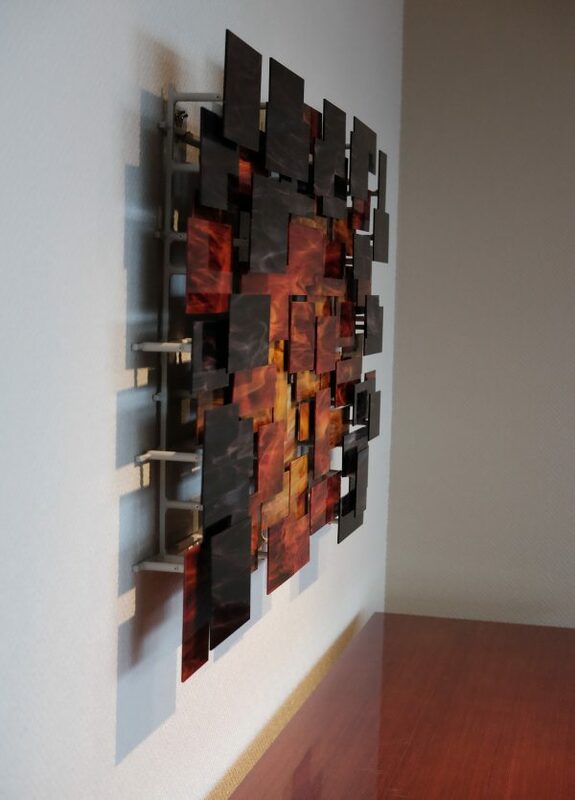 Need to know what the cost was to hang this glass art. Do you know of anyone in LA who could do it? We would recommend contacting an art museum or gallery in your area for recommendations on installation services. Loved seeing the art pieces in real homes. Beautiful! And inspiring!